UPDATE: I’m signing off now – a big thank you to everyone who joined in on the discussion and asked really insightful questions! It’s been a whirlwind few weeks since coming out from undercover and it’s been great to see people engage in the work we’re doing at HOPE not hate to combat the alt-right. Hi. My name is Patrik Hermansson. For the last year, I was sent undercover inside the alt-right by HOPE not hate, the anti-fascist research and campaigning organization. I ate and drank with them. I was in Charlottesville with them. They boasted about ties to the White House in front of me. They thought I was one of them. I infiltrated their groups in the UK and America - and I caught it all on camera. What do you want to know about my year with the alt-right? Why did I do it? How close was I to getting caught? Do you then have any evidence that similar mechanisms are in play for radicalization and gang participation for the young people involved? Is sexual harassment a widespread problem in our society? Or is it just in a few industries? And what is the largest barriers to these crimes being reported and the perpetrators being prosecuted? What was the scariest thing you heard or saw or experienced being undercover with them? The recruitment dynamics of the two are almost parallel at the initial stages. The NIJ is actually funding EXACTLY this research right now. This is Amanda Farahany. Sexual harassment is still a widespread problem in our society. Unfortunately, however, these are considered workplace problems, not crimes, and so they are not ever prosecuted. In the workplace, companies often cover up for the harassers because they are the ones that are high producers for the company. Charlottesville was obviously frightening, as was my time with the armed neo-Nazis in the Northwest. Some of the early meetings, before I fully gained trust, was of course nerve-racking but I found myself settling into it quicker than I thought I would. With the current changes happening in KSA, do you believe it will help eradicate terrorism or flame it more ? Hi Patrick, When you were undercover what was the closest you came to being found out? Was there a moment when you thought your life could be in danger? The speed of the current changes is mind-boggling and from the outside it's unclear where the sentiment of the population lies. If they largely support the changes then potentially the society will be resilient. What we know from the past is that terrorist groups look for opportunities to exploit, and political uncertainty provides those openings. The greater the unrest in the population, the greater the vulnerability. Unless handled very carefully the current situation can create conditions for more terrorist activity. Both Al-Qaeda and ISIS have openly listed KSA as targets in the past. This is Amanda Farahany. Reporting is usually very difficult for people, because at first, they believe they can make it stop themselves. Then, they fear for their job and being retaliated against for complaining. Finally, many people don't trust HR to handle the complaint appropriately, and fear that they will not be believed without something more than their word that it happened. I mixed up parts of my backstory a few times and once I said the first part of my real name by accident after a long day. It created some confusion but I managed to quickly explain myself. I think in the moment I came up with a story of how I sometimes was using my middle name...! It isn't. I used to manage a retail store and if a customer is harassing an employee you can ask them to leave, ban them from the premises, and/or call the police. At one point or another I've done all of the above which was perfectly within my authority. Did you find yourself empathising with them? This is Amanda Farahany. A company is responsible for ensuring that its employees are not harassed - both from other employees and also from customers. Your coworker should think about filing with the Equal Employment Opportunity Commission and/or talking with an attorney. She also can get unemployment - even if she quit - because she quit for a good reason under the law. At times you empathise with individuals on a human level. I spent a lot of time talking about their issues. But overall I was always aware of their ideas and what they wanted to achieve and that they liked me because of the colour of my skin. So at the end of the day it’s difficult to empathise with them. Rice pudding is pretty great, your answer is acceptable. However you then followed it up with flan, which is wrong, and thus I can no longer trust your expertise. 1) How tough does it get to prove the allegations? Are there any ways for victims to prove the harassment, if it is not recorded? 2) Apart from the Movie industry, what are the other industries where Sexual Harassment is prevalent? 3) Does Movie industry/corporations generally have special wings in HR department which deals with harassment or other such grievances? Is there any mandate on that? What did you find is driving people towards these beliefs? Were they instilled by family members? Is it simply a victim mentality? What's the driver and why are we seeing what appears to be a rise in these beliefs right now? This is Amanda Farahany. Many people fear coming forward to report harassment because they don't have "proof" or "evidence", but what most people don't realize is that their word is proof and evidence of what happened. A proper investigation by the company will include making credibility determinations about what really occurred. In addition, as we have seen with Harvey Weinstein, harassment is pattern behavior. Even Weinstein started out seeing what he could get away with, and as he was able to get away with it over and over, his behavior became even more outrageous. Looking in to someone's history who harasses will often reveal other victims. This is a really complex question and probably too hard to answer here quickly. The real question is what makes white men, many of whom are middle class and/or relatively well educated, decide that they - not ethnic minorities - are in fact the real victims in society. The whole movement is consumed with a sense of victimhood. They genuinely believe that white men are the most oppressed people in society. Understanding why this is is the key. The answer is very complicated. Often it is about a sense of relative decline. In other words they are not doing as well in life as they expected to. Many are from white middle class families, went and got a degree and yet are now in their mid-twenties but still don’t have a job and live at home. They then resent being told how ‘lucky’ and ‘privileged’ they are. In short, while they are privileged, they don’t feel it and this makes them angry and causes them to search for answers. The alt-right offers easy answers to these very difficult question: “Your life isn’t going as you planned, well here is someone to blame!” Of course, on top of this there is plain old racism, sexism, and hatred. Sadly I was born with functioning tastebuds. With there often being little, if any, direct proof of harassment: how can punishment (termination, sanction, character assassination) be justified when there is a contradictory account by the accused? Why did your group feel the need for you to go undercover? This is a really good question. HOPE not hate do undercover research for a number of reasons. Firstly, many far-right groups portray a far more moderate image to the outside world than they do in private. Going undercover allows us to expose the true hateful politics behind the scenes. However, it also gives us an unparalleled understanding of how these far-right movements organise and interact. We also gain information about their plans which gives us time to plan our response. We are always one step ahead! Have you covered many sexual harassment cases where the harassed was a male? Really respect your work. Did any alt-righter ever mention (1) the spread of disinformation or (2) the usage of ironic humour, for instance through memes, to propagate their ideology? If so, what did they say about it (e.g. were the vulnerabilities of new media seen as opportunities)? I don't think there is a SINGLE true interpretation of Islam or a SINGLE true way for people to live as Muslims in any era or geography. There are basics that are required as a bare minimum but beyond those there can be many true interpretations and it does not make everyone else wrong. In classical traditions, understanding of how people should practice their faith is always modulated by the context of their environment and individual circumstances. Do you feel bad about the eventual attack on America by your people, or will you try to apologize and tell us how wonderful your people are? This question is for Amanda. What has been your most interesting case? I'm also researching the far-right on digital platforms at the University of Amsterdam. One question we encountered: what is new about the new right? One 'answer' we came up with is that they now seem to be funny - nazi's usually weren't. The 'new-far-right' has a transgressive, politically-incorrect character on their side, which is often a pool for jokes, whereas leftist thought is often characterised by tolerancy, and pointing to the alt-right's incorrectness often ends up feeding the trolls/them stating you misinterpret them. How do you think one can best counter their use of transgressive humour? From your experience, were there ever lefist (online) actors that were effectively disturbing the alt-right narrative that subsequently annoyed the alt-righters you met? America is my people. Every American hurts when any American is attacked. Hi there – it would be great to follow up this discussion over email. Could you please drop us a line at [email protected] ? Thanks! Why do your people throw gays off of buildings and burn people in cages? Do you feel people not directly involved in the #metoo movement are just reposting it just to be part of something? How do you verify legitimacy of harassment cases? Hi, did you uncover any connections to current or former politicians? My people don't do that- the US criminal justice system does not allow for throwing anyone off buildings or burning people in cages. This is Amanda Farahany. Harassment cases are verified in lots of different ways, starting from looking at the history of the harasser to looking at the credibility of the victim. Often times, there are indications that someone is telling the truth, such as the victim telling her friends about what's happening as it was happening. What is appropriate workplace flirtation? In all the talk about combating sexual harassment I rarely hear anyone modeling appropriate sexual behavior. Where there any times when the alt-right showed agreement with the left? Anything they agreed on or was it all in direct opposition to the values of the left? This is Amanda Farahany. Just like a lawyer, I'm going to tell you - it depends. If there aren't issues of power dynamics, and the flirtation is welcome, then it's appropriate. On the other hand, if there are power dynamics - then it's going to be a problem if the conduct is unwelcome. On a younger base – Great question! It’s complicated of course and it differs between individuals what it is that attracts them. But generally speaking, the alt-right has managed to position itself as rebellious and a movement against the elites. They are also very good at making use of online forums and social medias where they have given lots of young men a sense of community and a cause to identify with. IMO modeling acceptable behavior could be more effective than just explaining unacceptable behavior. Do you know if anyone has studied this? What surprised you most or was most different from your expectations that you had before going under cover? Thanks for your question. I was surprised at how many young people are in it and and how international it is. It’s extremely well connected internationally. It’s also very openly racist but I was also taken aback by how much people in the movement glorify violence. What do these people actually believe in and is it coherent; and what do you think is the difference between the alt-right and other conservative groups? The views prevalent among the broad alt-right are often deeply incoherent, in part because the alt-right is essentially the coalescing of a number of disparate far-right ideologies, many of which clash, into a loose new movement. Also, views commonly held by the alt-right are often just not thought through; for example, how a “peaceful ethnic cleansing” could ever occur, or how a post-industrial economy could cope if all women are forced out of their jobs and back to their homes. As for differences between the alt-right and other conservative groups, part of what marks it out as new is the sheer extremeness of its positions, which far surpasses typically “conservative” groups, whom the alt-right generally treat with great hostility. The alt-right bucks the right-wing trend of trying to make right wing ideology more palatable by using softer messaging; the alt-right often tries to be as offensive as possible in order to turn off “normies” rather than win them over. Also the centrality of trolling online is a relatively new phenomenon on the right. Sorry if you've answered this already, but after your time with the alt-right how organised do you feel they are in terms of social disruption and organised acts of violence? It seems that what plagued groups before was that lack of leadership and cohesiveness. Are these gross more savvy? The alt-right are constituted by may different groups so it’s not cohesive but individual groups can be and they definitely have the ability for organised violence. But they don’t necessarily need to be organised to cause a lot of damage, to individuals and society at large. The hateful, dehumanising language and social pressure within these groups can make individuals commit violent acts. The Charlottesville attack is one example. In the US, I met with white supremacists group who promise to carry arms and practice for the coming race war. And in Europe there are multiple groups who do combat training for example. 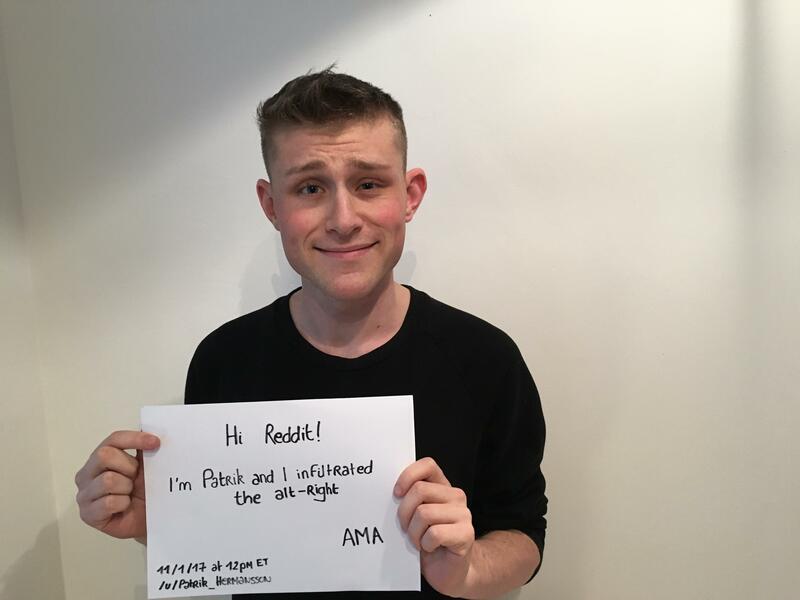 How concerned are you about doing this AMA, given the strong support for many alt right groups on this website? Hi – thanks for your question. No, I’m not worried. Ever since I exposed them I’ve got used to getting trolled by alt-right types. Hi, based on being so close with these guys, what do you think is the best way to counter them? Facts, feelings, ignore them, mental health? For those at the core of the movement the possibility of them changing their views is very slim, least of all as a result by presenting them with the (many) facts that debunk them. What will counter the views of those who are still only slightly red-pilled is likely going to be their engagement with counternarratives to what the far right offer them that address the fears and grievances that led them to alternative political voices in the first place. Similarly, their engagement with people from the groups the far right attack will help to humanise them and make them more resistant to divisive narratives. Facts matter, but (truthful) narratives that positively address the feelings that lead people to far right politics is more effective than just countering with facts. I would think that it was not hard to convince them that you were one of their own. I'm also white and male, and I find that most of the conservatives I know just assume that I agree with their insane positions and beliefs. How hard was it to hold back your true feelings and agree with their lunacy when you disagreed strongly with their opinions? I agree, there is an assumption that white males should "naturally" agree with them. There were times when I was very angry and what people were saying around me hit me very personally. At those times I was extremely frustrated and it was difficult not to react. How often did these guys use racial, religious it homophobic slurs? All the time. To be honest, it was extremely hard to be in the same room as these people at times, having to sit there and stay quiet as they came out with torrents of abuse. In your year in the alt-right, what was your scariest experience? Any experiences that nearly made you blow your cover, intentionally or otherwise? Good question! I mixed up parts of my backstory a few times and once I said the first part of my real name by accident after a long day. It created some confusion but I managed to quickly explain myself. I think in the moment I came up with a story of how I sometimes was using my middle name...! Would you say the alt-right generally smell more like basements or mace? Mace doesn’t really smell, so I’d have to say basements. Millennial Woes smelt faintly of hay, which was disconcerting while many others smelt of sadness and loneliness.